​Join us on the first Thursday of the month for this series. On March 2, we meet for an exploration of Brené Brown's powerful book, The Gifts of Imperfection. 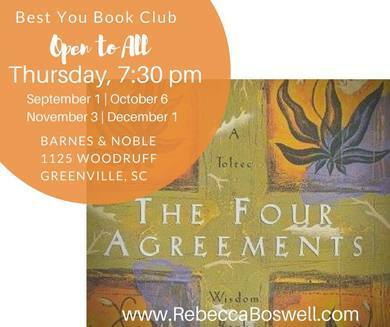 ​Join us on the first Thursday of the month from September through December, for the exploration of Don Miguel Ruiz's powerful book, The Four Agreements. This is a relatively short, simple to read book, yet powerful book. Its teachings offer practical tools for navigating the perceived complexities of life. What really matters in this lifetime, if you are not being you? Does being you seem confusing, difficult, or too abstract? What if being you was actually a personal key to freedom? What if the invitation to be you was all it took to shift what you have been receiving, or not receiving? Are you willing to come explore this? "Being You, Changing the World by Dr. Dain Heer This is a very different book. It is written for the dreamers of this world— the people who KNOW that something different is possible—but who have never had the tools before.... This is a Handbook for Generating Infinite Possibilities and Dynamic Change. For you. And the world. Ten years ago, Dr. Dain Heer started as a chiropractor in California, USA. Seemingly successful and happy, Dain Heer was on the verge of suicide when he came across Access Consciousness. With this modality, based on question and choice, Dr. Heer’s life began to expand and grow with more ease and speed than even he could have imagined possible. This book is his way of paying it forward. 'Being You, Changing the World', provides you with a set of PRACTICAL tools and processes which can change everything and give you YOU, as you truly be. It provides you with a totally different perspective of BEING. What if being you isn’t about doing something differently or being better? What if it is about BEING the energy you be, in totality? And what if that can change EVERYTHING? Your life, your relationships, your money situation . . . And the world! Access Consciousness is a system for opening the doors to anything that is possible in this world. By giving you access to your knowing. By dynamically increasing you awareness. By including everything and judging nothing. Today, Dr. Dain Heer travels all over the world inviting and inspiring people to more consciousness from total allowance, caring, humor and a phenomenal knowing. His unique points of view on of embodiment, earth, sexualness and healing transcend most things currently being taught. 'Being You, Changing the World' is his eighth book. From the back cover: 'I am not a guru. I have no answers for you. Just questions. Only you know what is true for you. What I am inviting you to, is exploring WITH me. My own path to consciousness is on going, as is yours. I use these tools every day and I keep discovering what else is possible, every day. If you’re willing, this book can guide you to Being You. And Changing the World. Is now the time?'" Rebecca will facilitate Circle and the book's personal meaning and unique application to you, using coaching and Access Consciousness Facilitation tools. In March, we take the next step. In Playing Big, by Tara Mohr, we look to access our Zone of Genius by learning to "play bigger" from the inside out. Featured on the Todayshow, CNN, and other media outlets, Tara Mohr offers, "practical tools to help women quiet self-doubt, identify their callings, “unhook” from praise and criticism, unlearn counterproductive good girl habits, and begin taking bold action." Click HERE to check out Tara's 10 Rules for Brilliant Women. Rebecca will facilitate Circle in order to clarify the book's personal meaning and unique application to you. In 2014 we explored what happiness is and how to cultivate more of it in our lives. We looked at what it takes to dare greatly, and how fear can only stop us if we let it. We looked at personal legends and the dream that we all live in, recognizing that when we allow ourselves and others to be as we are, we can find greater truth, as well as listen to what truth is for each of us. 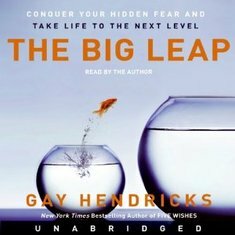 As we take the plunge into a new year, we begin with The Big Leap, by Gay Hendricks. We will explore how to overcome the negative sabotage we often engage in when things start to work well...too well? Through real life examples, Hendricks discusses the four hidden fears that are at the root of the Upper Limit Problem. We are then offered a method for identifying which of these four fears prevents us from reaching our personal upper limit, and then breaking through that limitation to achieve our Zone of Genius. Hendricks provides a clear path for achieving our true potential and attaining not only financial success but also success in love and life. This time last year we read Don Miguel Ruiz's book The Four Agreements. 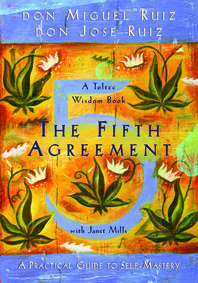 After a year of practicing these four powerful, yet simple, agreements, we will delve into the fifth agreement. What change might that bring? 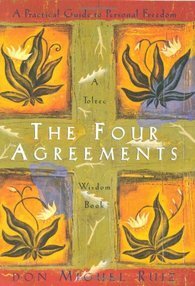 In this sequel, Don Miguel Ruiz and his son, Don Jose Ruiz, introduce the Fifth Agreement, intended to get us to our original authenticity through listening and awareness, so we might create that which is truly desired. We will explore the contents of the book together. Rebecca will facilitate Circle in order to clarify the book's personal meaning and unique application to you. Don't want to buy the book? Click HERE to read it on your computer for free. Our first fiction book, great for summer reading. 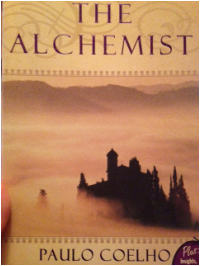 In this book, Paulo Coelho takes on an adventure that weaves within it themes of choice and destiny. In this Circle we explore questions like; What is your personal legend? What is the Soul of the World from your point of view? How does this affect your own personal journey of the world; What does Santiago teach us about following our dreams; and more. Come gather, connect, gain insight, and recalibrate your compass. Our series this year has explored the elements of happiness, courage through vulnerability, and now, for June, we look deeper into what is required to launch through those fears that keep us from showing up fully in our lives. 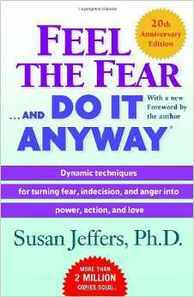 Susan Jeffers, author of Feel the Fear and Do It Anyway, has written a small, yet powerful book for assisting us in this process. • how to become powerful in the face of your fears–and enjoy the elation of living a creative, joyous, loving life. April is about Daring Greatly, thanks to the work of Brene Brown. 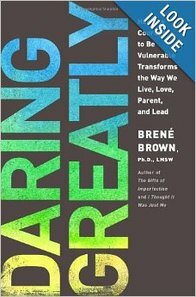 According to Amazon, "Researcher and thought leader Dr. Brené Brown offers a powerful new vision that encourages us to dare greatly: to embrace vulnerability and imperfection, to live wholeheartedly, and to courageously engage in our lives." We will explore the contents of the book and Rebecca will facilitate Circle to clarify where its message applies to you, as well as areas in which you are ready to take new leaps, spread your wings, and finally DARE GREATLY in your own life. Please RSVP to receive confirmation and preparation details (including instructions for the "Best Possible Self" exercise). 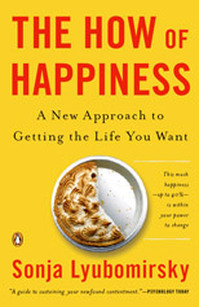 In February, we will continue January's conversation around happiness by exploring The How of Happiness: A New Approach to Getting the Life You Want by Sonja Lyubomirsky. We will use the book as a conversational starting point for a broader discussion on fulfillment and the role of choice in the creation of what we are getting. What are our barriers and what is required to achieve the "happier" states of heart and mind we desire? "You see here a different kind of happiness book. The How of Happiness is a comprehensive guide to understanding the elements of happiness based on years of groundbreaking scientific research. It is also a practical, empowering, and easy-to-follow workbook, incorporating happiness strategies, exercises in new ways of thinking, and quizzes for understanding our individuality, all in an effort to help us realize our innate potential for joy and ways to sustain it in our lives. Drawing upon years of pioneering research with thousands of men and women, The How of Happiness is both a powerful contribution to the field of positive psychology and a gift to people who have sought to take their happiness into their own hands." Please RSVP to receive confirmation and preparation details. Join us on Thursday, December 5th, for the exploration of Don Miguel Ruiz's powerful book, The Four Agreements. This Circle is an opportunity for a group of women to read a book that is intended to inspire, motivate, enlighten, and cultivate greater awareness. It is a way to read something you might not otherwise read on your own, AND THEN have the opportunity to discuss how the message is relevant to you and your life. Rebecca will facilitate this BWell event with the intention of creating a safe environment to share, uncovering meaningful insights, and encouraging rich discussion, while having a relaxed, enjoyable evening with other wonderful ladies. This is a relatively short, easy to read book with a big message. The idea is to read it now, so its message can provide a compass for navigating the hustle and bustle of the upcoming holidays with love and grace.